The subject of Pierrot (meaning an actor, masquerader, or buffoon) is unclear. It may have been a theatrical sign for a café or it could have been a sign for a fairground show. Generally the character of Pierrot in the Commedia dell'Arte was staged to be the fool. Watteau's sad clown has reason to be sad as he may be destined for a broken heart. Traditionally, the Pierrot's love interest, Columbine, leaves him for Harlequin. Despite his fate, the character of Pierrot is trusting and proves to be naïve, moonstruck and distant to reality. It is unknown whether Watteau himself was the inspiration for this piece, as some critics believe this to be a self-portrait, or whether the character of Pierrot was a friend of his, an actor, or an entirely fictional character all together. No matter who inspired the sad clown, this piece, like Watteau's other paintings, revolves around the theater. 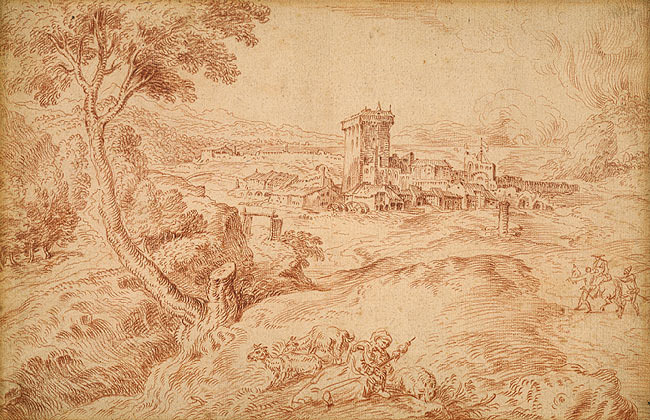 Such inspiration can go as far back to Watteau's time spent working with set designer Claude Gillot. Gillot introduced Watteau to the theater, specifically the Italian Commedia dell'Arte. In this piece Pierrot is the main attraction on the stage but is not the only character from the Commedia dell'Arte feature in his painting; the doctor on his donkey, the lovers Leander and Isabella, and the captain also make an appearance. Where style is concerned, Watteau's inspiration is borrowed from interior designer Claude Audran III whom he worked with after Gillot. His airy style can be attributed to what he learned with Audran. Watteau transformed the style that had begun to dominate interior design into his paintings. It is important for the viewer to understand the meaning behind a painting and how an artist approached his work. 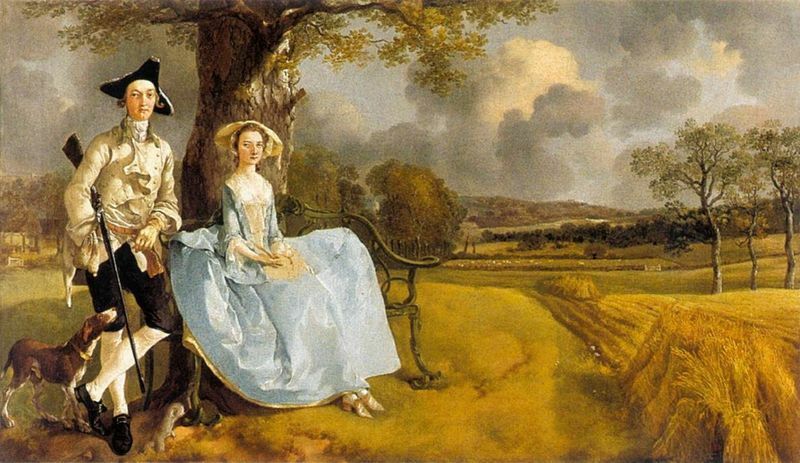 Watteau paid special attention to the composition, coloring, lighting and perspective of each piece. Pierrot draws the viewer's attention. His ballooning midsection is attention grabbing enough and his presence is at an elevated center stage. Still, he seems to go unnoticed by his fellow characters. Somehow, despite his external loudness, his inner quietness causes him to blend in. He is all alone in his world on stage. The viewer wonders whether to feel sympathy or overlook him and share the apathetic sentiments towards this lonely character. It seems that the artist took the generalized notion of the Pierrot into account, as his portrayal of the subject shows him looking down with arms to his side. Though his expression is questionable, his gesture seems to denote that of confusion. Perhaps he wonders how it happened that his love left him. It is also possible that he is still love struck and the heart break has yet to happen. While his face remains in the shadow for the most part, the right side more heavily than the left, it is interesting that Watteau chose to highlight the belly of Pierrot; he draws particular attention to what is clearly the most unflattering part of the character. Maybe Pierrot's face doesn't matter; not to himself, the people around him, or the viewer. Maybe not even to the artist. 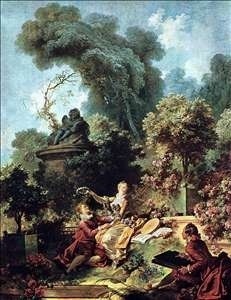 It is indeed a sad face, a theme contrasting Watteau's happier works of people enjoying love and flirting. Pierrot is not part of any festive group. His silly wardrobe stands in strong opposition to his counterparts. He does not fit in. Pierrot is seen head-on, enveloped by the characters below him and the trees surrounding him. The negative space in the upper left-hand corner draws attraction to his confused expression. 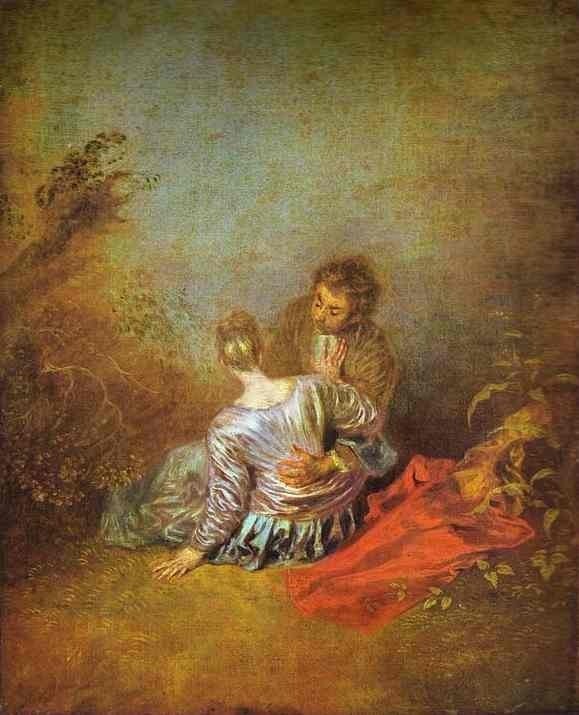 Watteau portrays all of this through light brushstrokes and equally delicate colors. He paints with a mostly neutral palette except for the laces of Pierrot's shoes and the bright red costume below him. Watteau's painted story of a sad clown carries the theme of loneliness and melancholy and he painted other works with a similar subject. 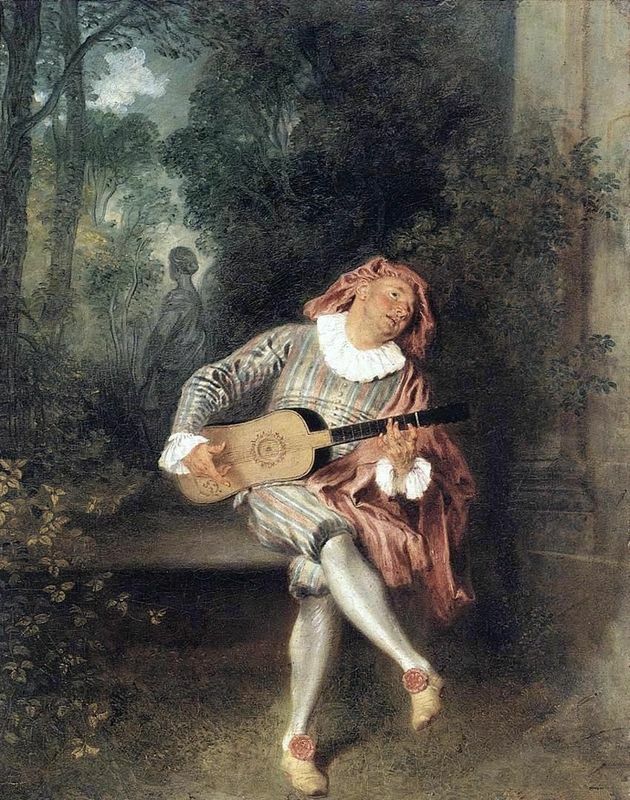 Watteau's Mezzetin once again features a troubled character from the Italian commedia dell'arte. It is unclear whether this time Mezzetin (whose name means "half measure"), like Pierrot, is the deceived lover or if he has played the part of the deceiving husband. Whatever he has done, he is alone on the stage with no other characters to comfort him, just like Pierrot. There is a statue of a female with her back turned on him in the foreground of the stage. Other artists have used the figure of a sad clown in their work as well. 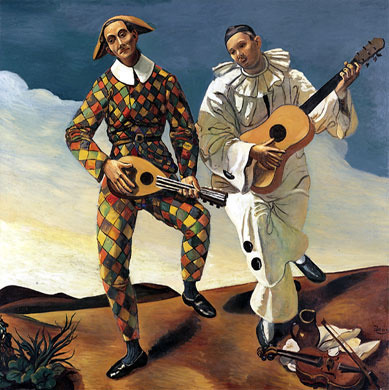 In Derain's Harlequin and Pierrot, silent musicians play stringless instruments amid a barren landscape. Their austere gaze adds melancholy to the piece. Like Pierrot, the Harlequin is also a character from the Italian commedia dell'arte and is the character that steals the Pierrot's love interest. Watteau's Pierrot belonged to Dominique Vivant Denon, director of the Napoleon Museum during the First Empire, before it was acquired by Dr. Louis La Caze, a keen collector of 18th-century art. 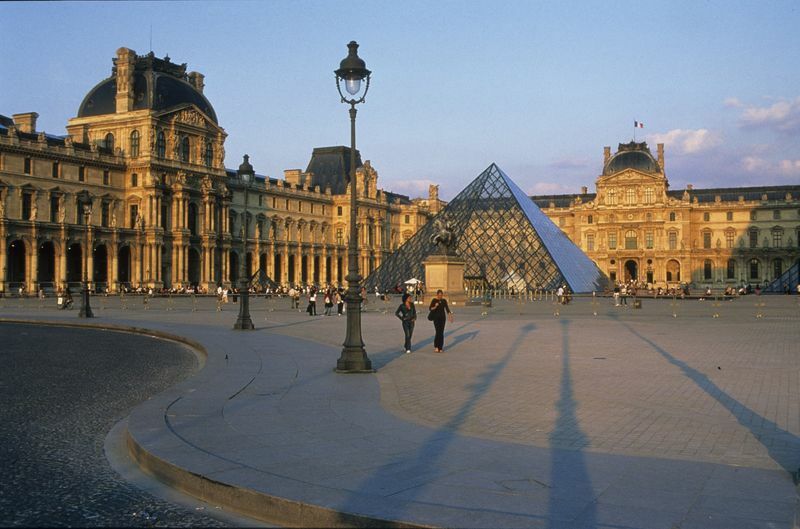 Louis La Caze gave all of his artworks to the Louvre in 1869. 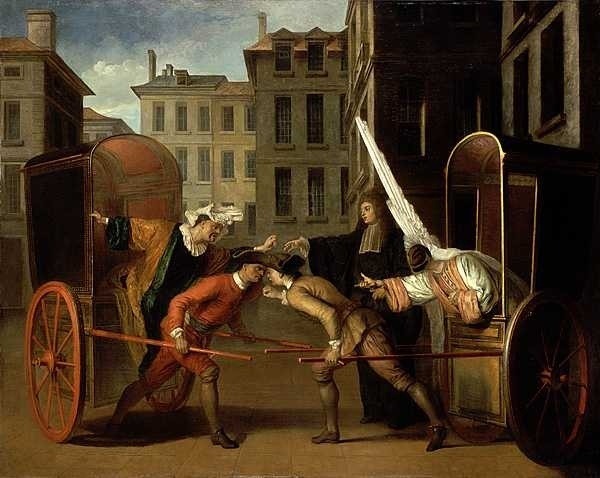 More modern art critiques, such as Jed Perl (author of Antoine's Alphabet) are spreading a renewed interest in Watteau. His appreciation for his "favorite artist" is contagious, as it inspires fellow art admirers. Pierrot has been featured in recent articles of prestigious newspapers, including the NY Times in 2008. Completed just two years before his death, Pierrot did not receive as much recognition as it deserved in its day. 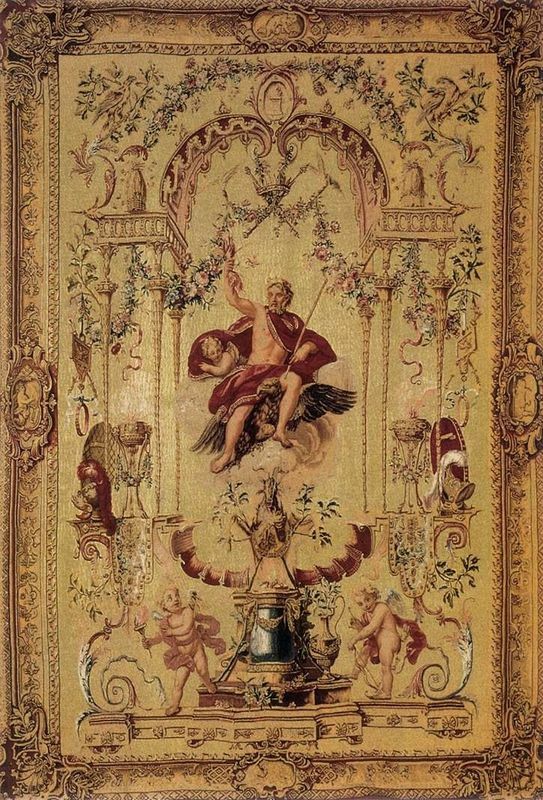 His time spent as an apprentice to set maker, Claude Gillot, contributed to his love of theater. Studying under interior designer Claude Audran III aided in development of beauty and enchantment of his design. 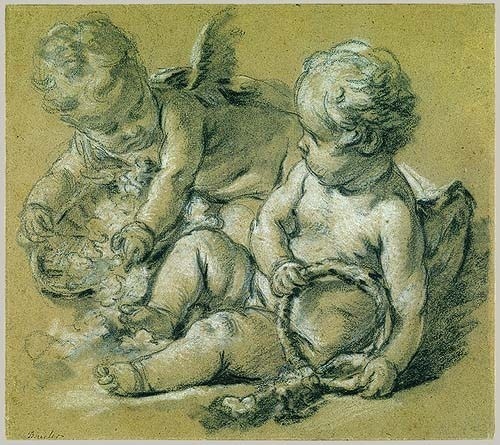 Rococo painting, as well as most French art of the 18th century was light, airy, frilly and bejeweled, which is fitting as it was intended for the powerful aristocracy and wealthy upper-middle class. Examples of Rococo art are displayed on the right.